It’s been a very long time since I’ve posted something made in my crockpot, almost two years in fact. So I was very happy when a crockpot dish won the poll last week. Plus, it just makes sense. It’s cold and you’re probably busy this time of year so a dish that you can RONCO (set it and forget it) is probably helpful. Funnily, this soup fits almost all of the categories in the poll last week. I swear that wasn’t planned… sometimes it just works out that way. I’ve made chicken tortilla soup before, but never posted on it. This version was, by far, the best version I’ve ever made though. Something about letting the flavors just kind of mingle all day long really gave the finished soup an interesting and deep flavor. 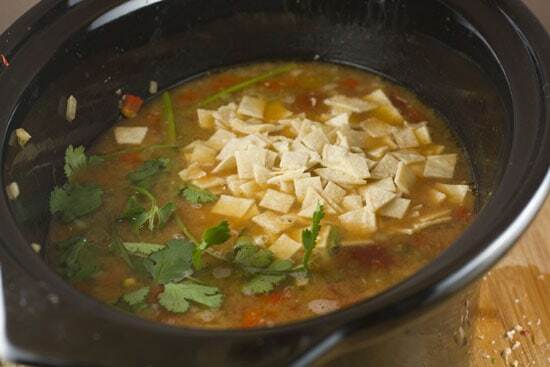 You’d be silly not to try this Crockpot Chicken Tortilla Soup! Crockpot Chicken Tortilla Soup is a delicious and slightly spicy chicken tortilla soup made in a crockpot! This is a wonderful meal to come home to! 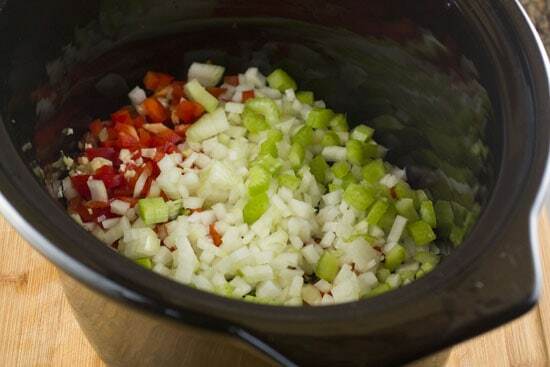 1) Finely dice the onion, garlic, peppers, and celery and add them to a crockpot. 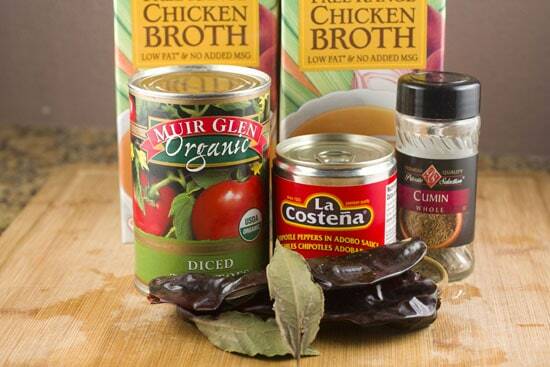 2) Also add in the chicken breasts, canned tomatoes, bay leaves, cumin seeds, dried chiles, and chicken stock. The stock should just cover all the ingredients. 3) Cover and set the crockpot on low. Cook for 6-8 hours. 4) Remove dried chiles and bay leaves and discard. 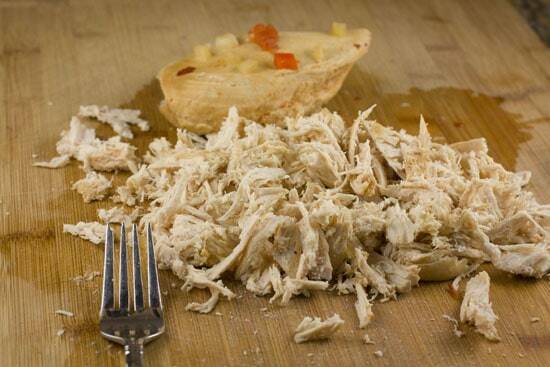 Remove chicken breasts, shred, and return to crockpot. 5) Add in cilantro sprigs, corn, and a few corn tortillas cut into bits. Let the crockpot simmer for another 30-60 minutes. 6) Season soup with salt and pepper. 7) To make tortilla strips, dice corn tortillas into strips and bake at 350 degrees for 15-20 minutes until lightly browned and crispy. 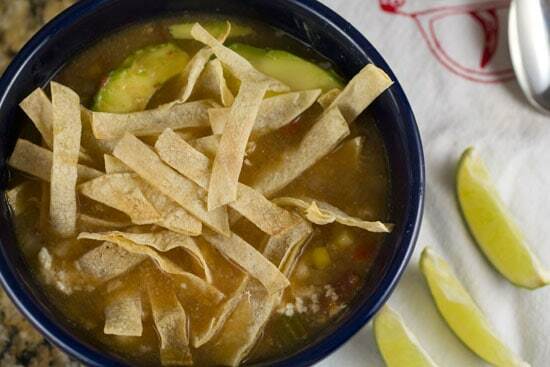 8) Serve soup piled high with tortilla strips. Other fun garnishes include lime wedges, crumbled cotija cheese, avocados, and sour cream. True. But hang in there. Most of them are basic stuff and once they are all in the pot, there’s very little work involved in this meal. You can go cross stuff off your list and come home to a delicious soup. 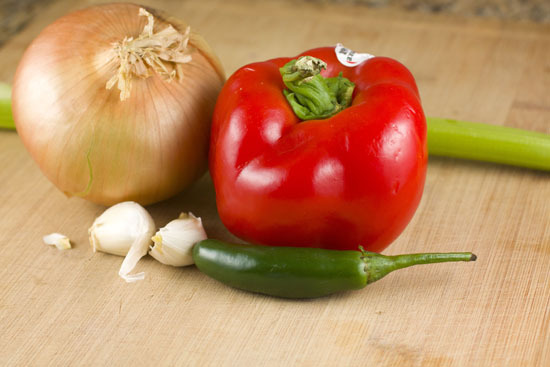 These are the few veggies that you need to start this soup. The key to these is to dice them pretty finely. For the Serrano pepper, I left the seeds in. You could take them out though if you’re worried about the heat. Then just toss all this stuff into your slow cooker! Besides the veggies you need a few other things to get this soup going. This is where a lot of the flavor comes from in this soup. Add all this stuff to the crockpot along with your chicken breasts. I would shoot for about a pound of chicken but you could use more if you wanted. For the chipotle pepper, make sure you dice it very finely. Nobody wants a big bite of chipotle in their soup. For the dried peppers, you can use almost any dried pepper. I went with New Mexico chile peppers, but poblanos would work also. Just break up the dried peppers into a few pieces and scrape out the seeds. Then throw the dried pieces into the crockpot along with the chicken breasts. Add in all your chicken stock which should just barely cover all the ingredients. Set your crockpot to a low heat and let this sucker cook, covered, for at least six hours. If you wanted you could cook it for even longer though. Six hours is the minimum. After that, your house will smell amazing and your soup will look something like this. There’s a few things we need to do to finish this Crockpot Chicken Tortilla Soup now that most of the cooking is done. For starters, take out the bay leaves and dried peppers from the soup and discard them. They’ve given the soup plenty of flavor and there’s no need to hang on to them. Next, take out the chicken breasts and use a few forks to gently shred the meat. Then you can return it to the crockpot. Finally, there are three new ingredients that I recommend adding at this point as they don’t need to simmer all day long. First, add some corn and cilantro sprigs. Second, cube up a few corn tortillas and add those cubes straight to the soup. Cover this and let it simmer for another 30-45 minutes. 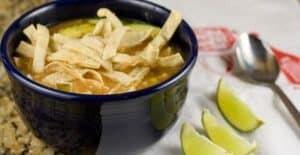 The tortillas will soften and some will completely disintegrate into the soup which will give it a really rich texture. The cilantro will give the soup a nice herb flavor. After it’s second cooking, remove the cilantro stalks and season the soup generously with salt and pepper. My favorite part of chicken tortilla soup is serving it with tons of fun garnishes and toppings and then people can kind of make their own bowls. 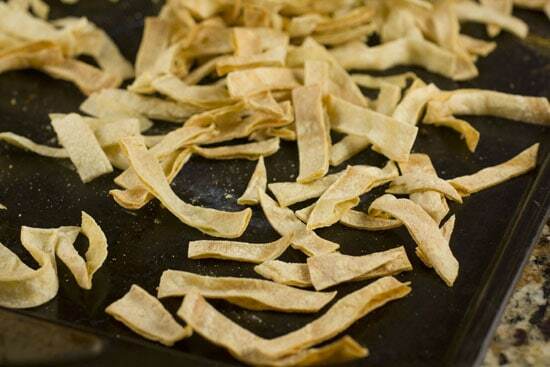 The essential topping (in my opinion) is crispy tortilla strips. These are super-easy to make. Just cut a few corn tortillas into long strips and bake them at 350 degrees for about 15-20 minutes. The strips will be lightly browned when the are done and super-crispy. 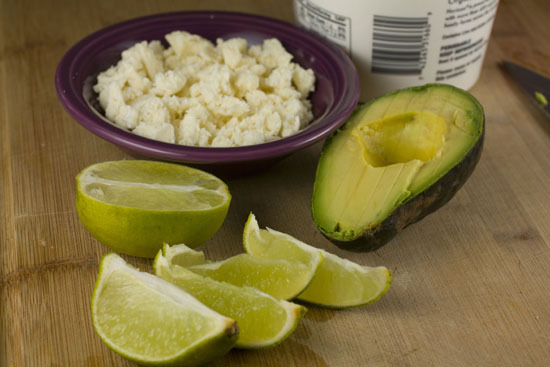 Some other topping ideas that I like are sliced avocado, crumbled cotija cheese (or any cheese really), sour cream, and lime wedges. Once your soup is seasoned well with salt and pepper just ladle it into a bowl and pile on the toppings! Crockpot Chicken Tortilla Soup is actually a very filling meal for soup because of the chicken, tortillas, and cheese. It’s very warming and just a complete winner of a meal in my book. Don’t be daunted by the ingredient list here, people. You can and should give this a shot sometime this winter! The cute little napkins in this post were kindly donated by Oh Little Rabbit. Cool soup! Sounds delicious! Also, visit me over at The Savvy Kitchen (www.savvykitchen.blogspot.com) to enter my giveaway! I’m so glad that crockpot won the poll, I like to refer to mine as my “sister wife” this time of year. Coming home to dinner already prepared is a fantastic occurrence and this will definitely be waiting for me in the near future. I’ll definitely be making this next week! Did you use bone in or boneless chicken breasts (hard to tell from the photo). I have both in the freezer, but I’ve heard that bone in have the best flavor and are more tender. I used boneless, but you’re right that bone-in would be more flavorful in something like this that is simmering. Frankly, you could toss in like half a whole chicken if you wanted. 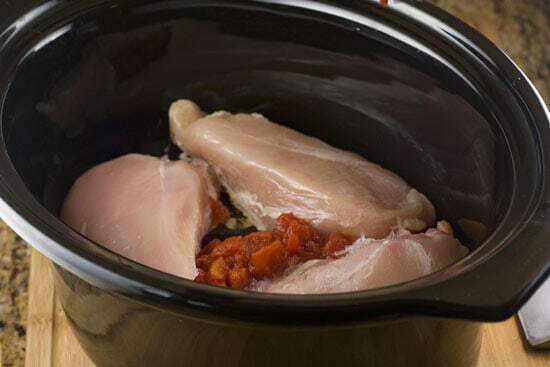 Probably one of the best crock pot recipes I have ever seen and I especially like the idea of using half a chicken, get that marrow and red meat in there. Another garnish that I love and that is often used in Mexico is a whole “chipotle in adobo” sauce. The sauce is the best part as u can swirl it around in the soup and it adds a wonderful “smokey” element to the soup. Thanks for the recipe, as we just finished moving to Mexico and “time is not on my side” at the moment! Now I am excited to start up the crockpot and uncover the Christmas decorations and know that a meal will be ready w/o a lot of fuss! Jo Ann, would you add a whole can of that straight? That sounds delicious! Made this last night – it was fabulous! I didn’t have any chicken broth, so I just added water, and I subbed an anaheim pepper for the serrano. The kids still thought it was too spicy, but they ate quite a bit. 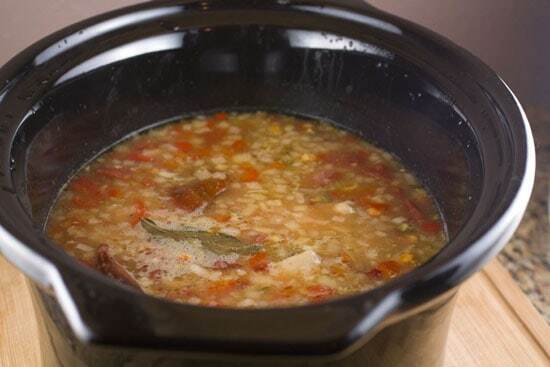 Thanks for a great crock pot recipe, I’ve been trying to use mine more now that the weather is cold. It’s so nice to come home to a great smelling house and a warm meal! does anyone have trouble with their crock pot cooking too hot? if i leave boneless chicken breast in my CP on LOW for 6 hours they come out very dry. i made goetta and it was actually boiling around the edges on LOW. i am thinking of putting it on HIGH for 2 hours then let it go to KEEP WARM for the remaining cook time. I made this and it lasted me and my husband 3 delicious nights. I have to say, by the 3rd night, the flavor was the absolute best…the soup- while good the 1st day- seemed to get better with each day. (a great surprise with leftovers!) I made it without the 2 dried new mexico peppers- but next time I’ll probably add them just to see what I was missing. What is the ingreidient in the can other than the tomatoes? It looks like it’s some kind of Chipotle in a suace?? @ angela – yes that is the chipotle peppers in adobo sauce. the sauce is thick and very dark – spicy and smoky like the peppers. the peppers are barely intact after being canned in the sauce. Looks delicious! I don’t have a crock pot ( I know, crazy but I don’t!). How long should I cook it on the stove? Or in the oven? Thanks! Yikes. Sorry it took me so long to reply! You can definitely do this on the stovetop. Bring it to a simmer and let it simmer for 45-60 minutes. Much faster actually, but requires more hands on time as you need to stir it occasionally. Making it now while watching football playoffs…smells good! Will be so nice to have dinner done after the games with little effort. I made Tortilla Soup for the first time tonight and it was excellent!!! -Omitted red pepper, celery, and tortilla in the soup. -Used just 1 bay leaf (because I’m not overly fond of the taste). -Added two generous tablespoons of the chipotle adobo sauce to add smokiness. Next time I think I’ll use two chipotles to add some more flavor and heat. I dream about this soup! making it right now, and it will be the second time in a week. Thank you for such a delicious and easy recipe! Various forms of football can be identified in history, often as popular peasant games. Contemporary codes of football can be traced back to the codification of these games at English public schools in the eighteenth and nineteenth century.’..